Help students with their time-telling skills with oversized clocks, quiz cards, books, and puzzles. 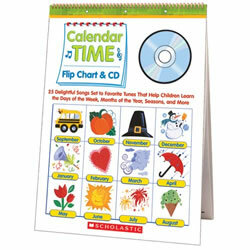 Kaplan also offers pocket chart and magnetic calendars. 5 years & up. 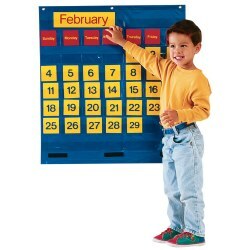 Our large monthly calendar comes with 31 date cards, 7 cards presenting each day of the week, 12 month cards, and a teaching guide to complete the 52- piece pocket chart set. Day and month cards are in English and Spanish. Sturdy construction includes hanging grommets, hook and loop fasteners for attaching other charts, and a weighted bottom. 27 1/2"L x 31"W. Cards approximately 3" x 3". 3 years & up. 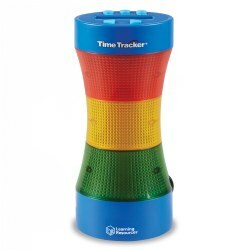 It's never been easier or more fun to keep kids on track with this unique lighted electronic timer and clockl Easily program green, yellow and red sections to indicate that time is running out. With 180 degree viewing, it teaches time management. Perfect for: study sessions, projects, tests, experiments, practice sessions, classroom assignments, cooking, hearing impaired, and more. Measures 8" x 4". Requires AC adapter or 4 AA batteries, not included. Grades 1 - 4. 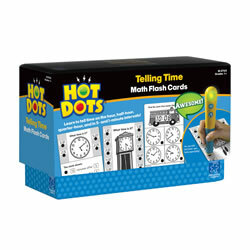 Students build time telling skills and get instant reinforcement with Hot Dots®. Includes 50 double-sided cards that can be used independently or as a teacher directed flash card. Hot Dot Pens sold separately. 4 years & up. 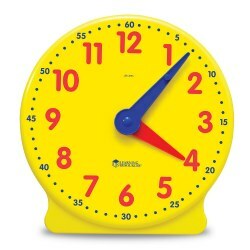 Use these best-selling clocks to teach time to the hour, half-hour, quarter-hour, and minute. Child friendly and easy to use. 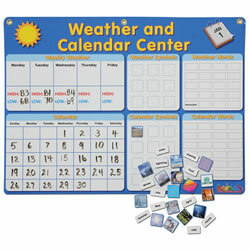 Perfect for learning centers or for small group instruction. 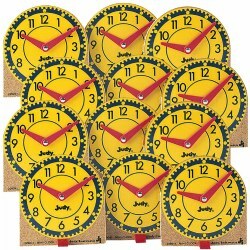 Each clock features moveable plastic hands mounted on a sturdy wooden base. Individual stands are included. A great companion to the Original Judy Clock (sold separately). 4 years & up. Demonstrate and practice time-telling concepts with this ideal classroom pack that includes one Original Judy Clock, 24 Original Mini-Clocks, and one Teaching Guide. A perfect hands-on learning tool for every student. Best Seller! 4 years & up. The Original Judy Clock is still a favorite amongst students and teachers. 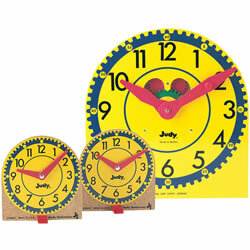 The Judy Clock makes learning to tell time simple and fun for children. Visible functioning gears maintain correct hour hand and minute hand relationships. Movable hands, visible functioning gears, and elapsed time bezel introduce children to concepts of time, motion, and cause/effect. Permanently assembled. Includes teacher's guide. 12 3/4" diameter x 13 1/2"H. Mini-clocks are sold separately. PreK & up. 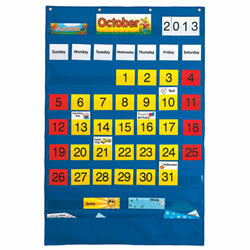 Develop calendar skills with this BIG laminated flip chart with spiral binding on top. It features 25 delightful songs set to favorite tunes that help children learn the days of the week, months of the year, seasons and more. Introduce poems for each month and great to use during circle time and perfect for shared reading. Grades K - 3. Display this versatile handheld timer on a desk or wear it around the neck (stand and safety lanyard included) to time classroom activities like assessing fluency, measuring elapsed time and more. An optional 1-minute beep function emits a tone every 60 seconds for individually timed fluency tests. 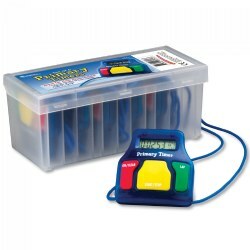 Set of 6 timers with batteries and storage case. 4 years & up. 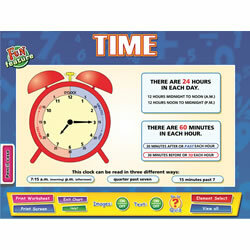 It's fun to learn time with this vibrant activity clock! 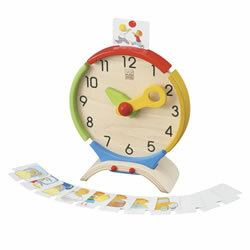 Includes activity cards that can be placed on the top so children can match the time with their activity. Measures 8.2" x 3.5" x 9.7". Grades 1 & up. This comprehensive and engaging whiteboard chart provides all the necessary information needed for reading and identifying time. Bold and colorful visuals, combined with the interactive screens allow students to explore and learn the three different ways time can be expressed. 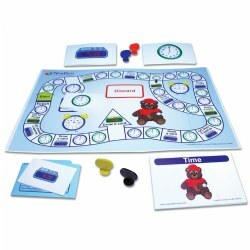 The accompanying Fun Feature allows students to practice what they have learned about time whilst the interactive quiz and worksheets are great as classroom activities or homework. CD-ROM. 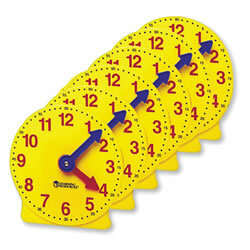 Engage small groups or individual students in time-telling activities with these geared clocks. Color-coded hour and minute functions. Set of 6. 3 years & up. 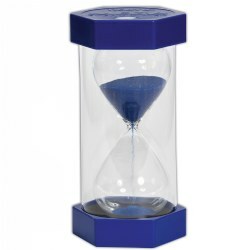 Catch younger kid's attention and help them learn about time measurement with this extra-large hourglass timer. Perfect for every space. Outside of the timer is made from shatter-proof plastic to protect the inner hourglass. 5 Minute timer. Size: 12" x 6". 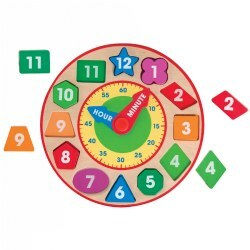 The perfect set of tools to help children visualize time from seconds to 10 minutes! Ideal for science experiments, time management and games. 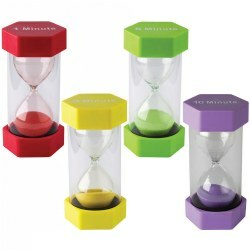 Time-tested, durable plastic timers with colored sand. Each timer measures 3 1/4" x 6 3/8". Available separately or purchase the whole set of 4. 6 - 12 years. 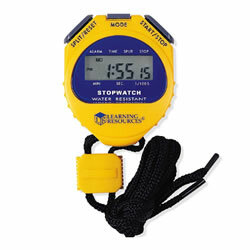 This kid-friendly stopwatch makes telling and measuring time easy to comprehend. Features include 0.01 second increments with calendar/date display and an alarm with hour chime/snooze setting. 3 years & up. 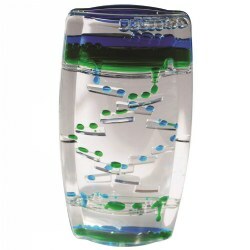 This set of Sensory Liquid Hourglasses will captivate and fascinate kids. 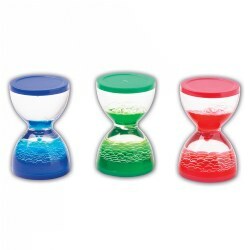 Turn each hourglass upside down and watch as colorful oil collides with water for form different size droplets that rise or fall in a variety of ways. Ideal for developing quiet focus and simple scientific principles, sparking curiosity, and more. 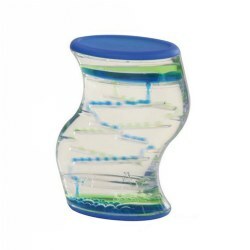 Outside casing made from durable, non-toxic plastic. Size: 2.75" x 1.75". 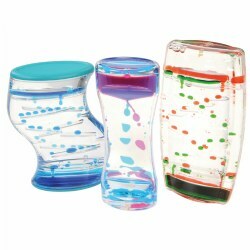 Included: 3 Chubby Sensory Liquid Hourglasses: Red, Blue, and Green. 3 years & up. 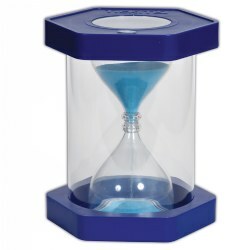 This enormous, clearview sand timer is the perfect visual learning tool for any space. Look through the top and watch the blue sand funnel down through the hour glass or watch from the sides. Giant size and colorful sand makes measuring time more fun. 5 Minute timer. Size: 12.80" x 10.63".